Gangrene develops when part of body tissue dies. This often occurs because the tissue is not getting enough blood from circulatory system. Gangrene usually affects limbs — the areas farthest from heart, such as toes and fingers. It can affect other parts of body as well. Gangrene can even affect internal organs. The condition typically starts in a specific part of body, such as a leg, hand, or internal organ. 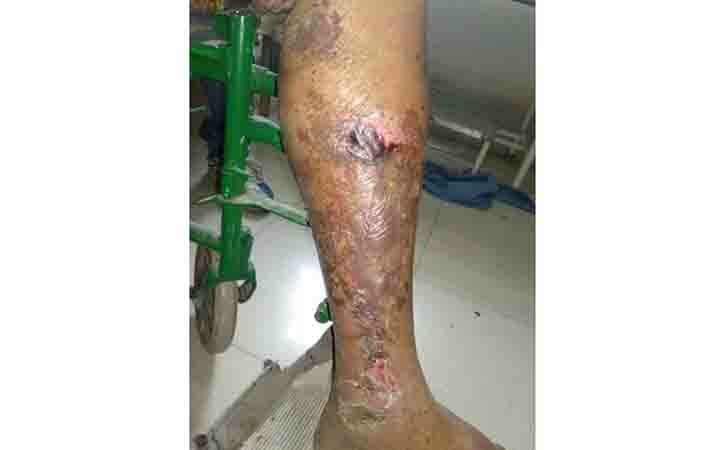 Gangrene can spread through body and cause to go into shock if untreated. Under the care of a doctor, taking appropriate antibiotic surgery period. All of organs like: liver, heart, and muscles need oxygen to function properly and need oxygen for survive. The oxygen is carried to different parts of body by blood. Dry gangrene occurs when one of body parts isn’t getting enough oxygen. Eventually, the body part will start to deteriorate and die. With dry gangrene, the skin is closed and there is no evidence of infection. Wet gangrene happens when body tissues become infected with bacteria. The tissues react to the presence of bacteria by growing moist and breaking down. This process causes the death of tissues. It’s an emergency than dry gangrene because of the possibility of infection spreading to other parts of the body. Gas gangrene and clostridial myonecrosis are interchangeable terms used to describe an infection of muscle tissue by toxin-producing clostridia. This organism, originally known as Bacillus aerogenes capsulatus, was later renamed Bacillus perfringens, and then Clostridium welchii. The organism is now named Clostridium perfringens. These bacteria create an infection that causes gas bubbles and toxins to develop inside the affected area. The resulting gases cause tissue death. 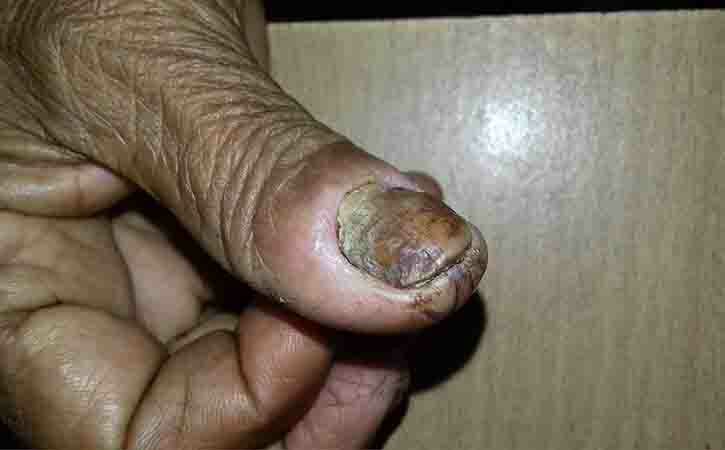 This type of gangrene can be fatal. A patient first complaint for dry gangrene is a reddish line that develops around the affected tissue. This line may later turn black. All forms of gangrene happen because of a loss of blood supply or infection by bacteria to a certain area. This deprives tissue of oxygen and nutrients, causing the tissue to die. Raynaud’s disease: There is impaired circulation to the ends of fingers and toes, especially in cold weather. Injury: Deep, crushing, or penetrating wounds that are sustained in conditions that allow bacterial infection can lead to gangrene. Doctor may prescribe antibiotics if bacteria are present. These are typically given intravenously, or through a needle directly into the bloodstream. In serious gangrene, the dead tissue or body part may need to remove. This process is called debridement. Debridement can be done with surgical tools or with chemicals. The goal of this type of surgery is to remove the affected areas to prevent the spread of infection and rid the body of the dead tissue. One alternative form of debridement, known as maggot debridement, uses fly larvae to eat away bacteria and dead tissue. Doctors are sometimes able to restore the flow of oxygen to the affected area. Skin grafts can repair any damaged tissue. This procedure uses a piece of healthy skin from elsewhere on the body to cover the damaged area. For severe cases, amputation of a limb, finger, or toe could be necessary to save life. People who must have part of an arm or leg amputated due to gangrene may be fitted with a prosthesis, or artificial limb, to replace the missing body part. As soon as possible visit a doctor when patient feel a symptoms. Doctor can suggest about lifestyle modification. So anyone get suggestion from a doctor to avoid complications.